Sidewalk signs from Signs Express are highly effective at driving more potential clients into your place of business. In todays competitive marketplace, anything that you can do to direct more customers to your place of business is crucial. The design team at Signs Express are experts in creating eye-catching sidewalk signs. The most common uses of sidewalk signs is promoting a special or giving directions. Churches, schools, and businesses of all kinds buy A-frame sidewalk signs because they are very cost effective and highly efficient at attracting attention and getting their point across. 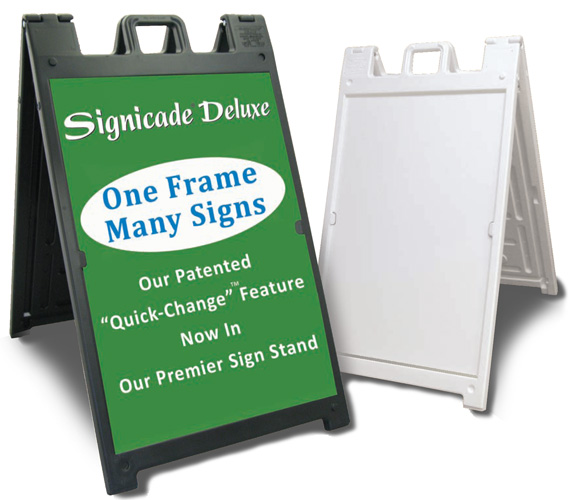 A very popular sidewalk sign that Signs Express sells is the Signicade. It holds two 2’x3′ sign faces and is made out of a high impact plastic for many years of trouble free advertising. It features built in handles and hinges for easy transport. Choose from either corrugated plastic faces or aluminum faces and the faces can be rotated out easily to keep your sign current. The signicade is hollow on the inside to allow for adding weight to the sign in windy areas by adding sand to the inside of the signicade. Signs Express also sells larger custom A-Frame Signs and skid signs made out of MDO plywood. These are generally used by apartment complexes or churches to send a message in a larger fashion. 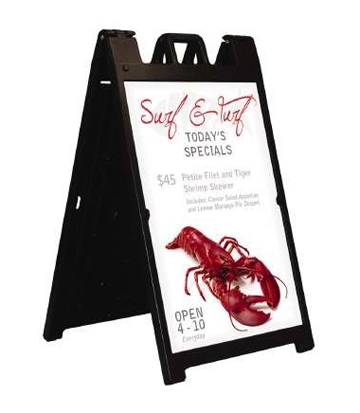 Various sizes of A-Frame signs all the way up to 4’x8′ are very common for these types of applications. Skid signs are perfect when a larger sign needs to be portable and sturdy.